Spartan 1, retired U. S. Navy Seal, backlighted and voice-altered for whistleblower interview videotaped with Earthfiles Reporter and Editor Linda Moulton Howe. 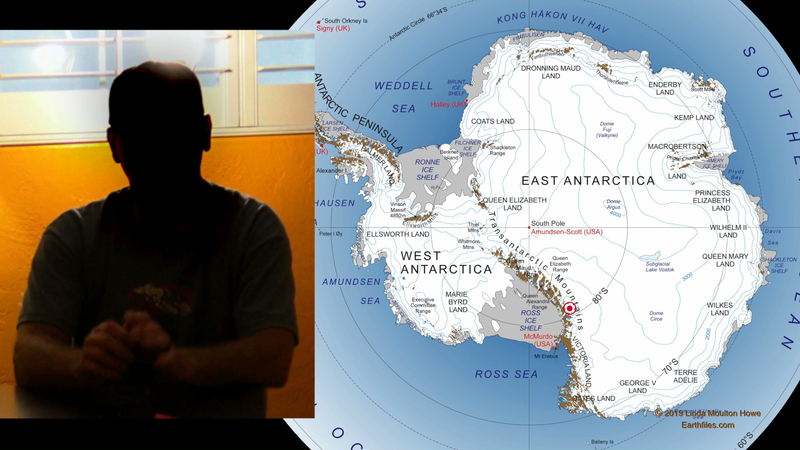 His firsthand testimony is from a Special Operations mission to investigate huge structures deep under Antarctic ice discovered by deep ground and ice penetrating radar at the beginning of the 21st Century. This is Part 1 of a video series © 2018 by Linda Moulton Howe. January 23, 2019 Albuquerque, New Mexico – Earthfiles Reporter and Editor Linda Moulton Howe has been working for two years to report one U. S. Navy Seal’s eyewitness account of huge structures deep under Antarctic ice. Tonight LIVE for the first time on her Earthfiles YouTube Channel broadcast between 6:30 PM – 7:30 PM Pacific / 9:30 pm – 10:30 PM Eastern, Linda will share the first part in a video series with backlighted, voice-altered whistleblower Spartan 1. Between 34 million and 100 million years ago, Antarctica was warm and tropical. Then by 33 million years ago, the temperature had dropped and ice and snow piled up over the next millennia ranging from 1 to 3 miles deep over most of the continent at the South Pole. Does that mean the large structures that Special Ops have investigated for the past fifteen to twenty years are more than 33 million years old? Previous PostPrevious January 21, 2019 — Updated with Orange Lunar Eclipse Image from Chile. Next PostNext 2nd Mysterious Repeating Fast Radio Burst (FRB) Discovered – What Are They?